PHILADELPHIA, PA – December 11, 2017 – Janney Montgomery Scott LLC (“Janney”), a leading full-service wealth management, financial services, and investment banking firm headquartered in Philadelphia, PA, announced the hiring of Thomas K. Hagigh. 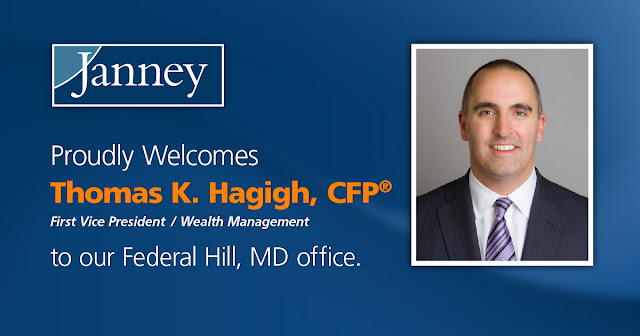 Hagigh joins Janney’s Federal Hill, MD branch office, which opened in November. Hagigh, First Vice President/Wealth Management, was previously affiliated with Wells Fargo Advisors. A Certified Financial PlannerTM, Hagigh has over 20 years of experience in the financial services industry. He graduated from Washington and Lee University with a Bachelor of Science degree in biology and a Master of Business Administration degree from Loyola College in Maryland. Janney’s Federal Hill, MD branch office is located at 145 West Ostend Street, Suite 400, Baltimore, MD 21230.